It’s hard to scroll through a newsfeed these days without running into a link (or three) promising to reveal “10 amazing lifehacks” that will change the way you cook, clean, or organize your home. What if I told you that it was possible to hack your own brain, and rewire it for business success? I admit, it sounds a little like science fiction. But stay with me for a minute. One of the amazing things about the human brain is its adaptability. Bad memories and perspectives that keep us stuck in a rut can be changed. This is great news for your personal life, but also has huge implications for your business. Let me tell you how to change your mind. A lot has been written about the power of positive thinking. In fact, the way that you think can actually change how your brain works. One study showed that physical changes happen in the brain whether someone is actually playing a piano or just thinking about it. This kind of mastery over our own brains gives us the opportunity to rewire ourselves. Think of your brain’s different parts and connections as muscles – try to work the ones that you want to get stronger. Train your brain to be more productive by regularly coaching yourself into a productive and positive state of mind. Making and exercising those connections makes it easier for your brain to default to that state in the future. Our perspectives have a big impact on the choices we make. The neat part about this hack is that you can apply it company-wide! In 2000, Proctor & Gamble lost market share in seven of its top brands. By 2010, they’d turned it all around. Not by making big changes, but by subtly shifting the way that they approached business, and looking at their products from the perspective of their customers. Zappos is another fantastic example of a company that won amazing customer loyalty through shifting its perspective. Reworking your company culture can be a potent way to unlock this potential company-wide. Culture experts Delivering Happiness say that companies with a higher sense of purpose outperform other companies – by 400%. Zappos CEO Tony Hsieh points out that a positive company culture leads to employees becoming more engaged and taking more ownership of their work, which leads to better customer service and financial performance. We used to think of a memory as being a more or less permanent fixture in your brain, but it’s more like a biological conference call between a network of cells. The stronger the connections, the better the memory. Neuroscientist Elizabeth Loftus described memory as being a bit like a Wikipedia page- it can be changed with drugs, behavioural therapy, or just plain old persuasion. How does this help you in business? Your choices are influenced by your past experiences, and suffering a failure can make you less likely to take a risk in the future – even if it is a smart one. On the other hand, strong memories of success can give you the confidence to seize opportunities. The good news is that altering your memories is nowhere near as complicated as Eternal Sunshine of the Spotless Mind made it seem. Practice thinking about your successes and failures in ways that amplify the positive emotions and downplay the negatives ones – when you think back to failures, make the memories seem small and hazy, and add silly details that detract from what went wrong. If you do this enough times, it’ll physically change the connections in your brain that play that memory in your head. On the other hand, remember business successes with as much detail as you can muster, really focusing on how it felt to nail that deal or get that praise in front of your team. Then let that feeling motivate you! 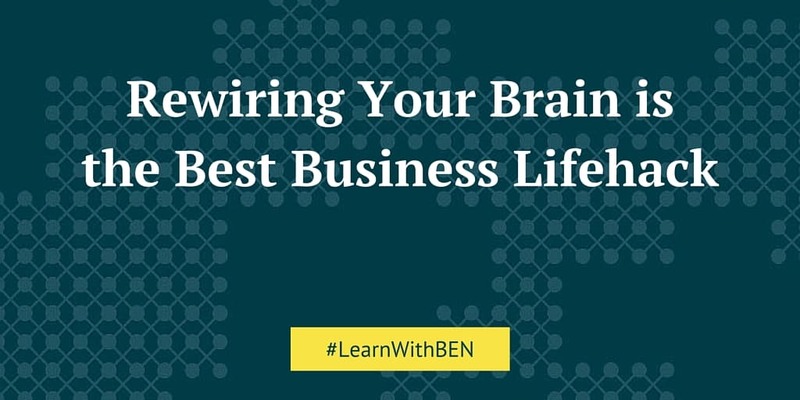 With the right guidance and a little bit of effort, anyone can rewire their brain for business success, helping them make better decisions, be more productive, and drive innovation. Want to know more? My latest book, The First Habit: The One Technique That Can Change Your Life (which you can get for free by clicking here) will get you started on how to rewire your brain and unlock your full business potential.